The Z540M offers unmatched quality, performance, and comfort, along with exceptional maneuverability and trimming capability. 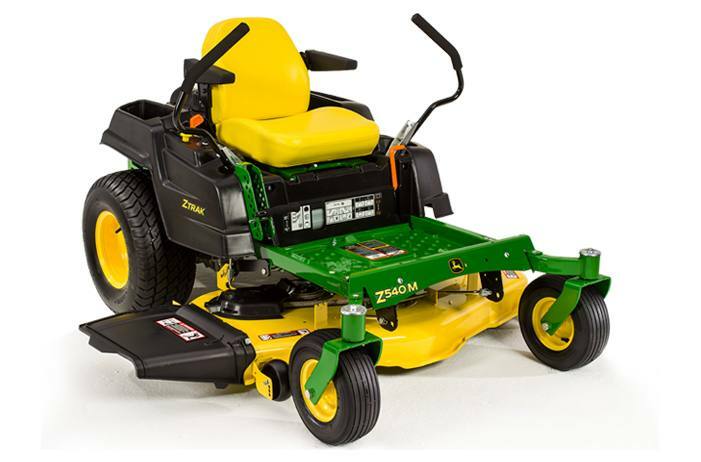 This mower is designed to efficiently tackle a wide variety of your mowing jobs. The Z540M is equipped with a 48- or 54-in. Accel Deep™ mower deck that can side discharge, mulch, or collect with a material collection system, or a 62-in. Edge™ Cutting System that can side discharge or mulch. The 48- or 54-in. Accel Deep™ mower deck has a single-piece stamped steel shell specially shaped to maximize airflow for optimal cut quality, especially at faster speeds. What makes the Accel Deep™ mower deck unique is its nearly 5-inch-deep shell that extends all the way around, and its smooth shape. The deep shell maximizes airflow to lift grass up for the most level cut possible. For your biggest mowing jobs, the 62-in. Edge™ deck also has a deep-deck design that lifts grass for a clean, even cut, and a smooth underside to prevent grass buildup and evenly disperse clippings.